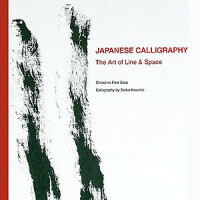 ‘In this workbook sumi artist Christine Flint Sato presents a new way to work with sumi, or the East Asian ink medium. Trained in calligraphy (shodō) and ink painting (sumi-e), she has distilled some of the basic techniques of both art forms into an innovative workbook for all. 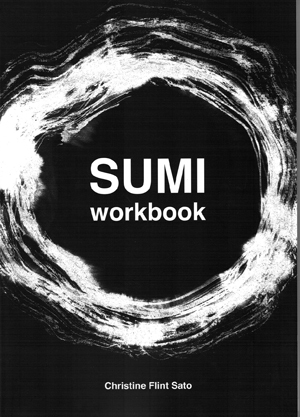 Based on her experience of leading sumi workshops with both Westerners and Japanese, the workbook offers a non-traditional way of using the sumi medium. It encourages people to connect with the medium directly and to develop a personal understanding of the way it works through practice and experimentation. The workbook is both informative and practical. Materials and tools: the sumi ink, inkstone, paper and brush are introduced, and their characteristics, how they interact and how to care for them is explained. The workbook shows how design elements: dots, lines and shapes, and how wet and dry brushwork effects are used in the sumi medium. Each chapter includes step-by-step practice exercises, which are designed for a wide range of practitioners, artists and non-artists alike. Suggestions for experimentation are made throughout the workbook, and there is advice on how to make a finished artwork. Sumi work by participants in workshops in the UK and Japan, and the author’s sumi paintings make up the concluding chapter of the workbook. There is a glossary of Japanese terms used in the workbook and a recommended list of suppliers at the end.